Providing useful and trusted information online is a complex and important responsibility, especially around elections. Our aim is to build helpful tools that get you to the information you’re looking for. As we get closer to the EU Parliamentary elections, alongside our broader package of support, we’re making it easier to help you access quality content online. We’re also working in partnership with fact checking organizations to support a healthy news ecosystem online, as well as helping voters get the information they need more broadly. On Google Search, we make algorithmic updates every day to ensure we surface authoritative content that’s useful to you. On YouTube, too, we’ve invested in new product features to make authoritative sources more prominent, including launching Top News and Breaking News in the U.K., France, Germany, Spain, Italy, Poland, Netherlands and more. These features make it easier for you to find news from verified sources by highlighting videos in the Top News shelf, or showing the Breaking News shelf on the YouTube homepage for key news events. We’re working on bringing these features to more European countries in the coming weeks and months. We’ll also be launching publisher transparency labels on YouTube in even more countries across Europe, including the U.K., France, Germany, Italy, Spain and Poland. These labels will appear on the YouTube videos from channels of news publishers who receive government or public funding. Our goal here is to equip you with more information to help you better understand the sources of news content that you choose to watch on YouTube. For those hungry for EU election-related news, there’s a specific destination in Google News to get you to the top journalism on the election topics you care about, faster. 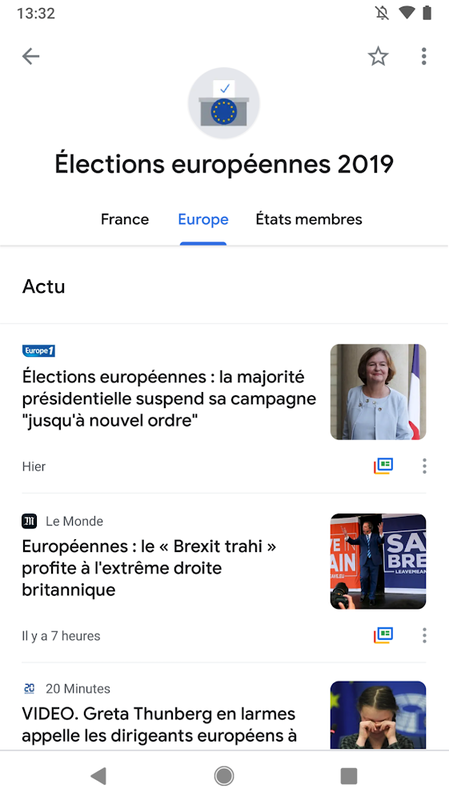 You’ll see a dedicated “2019 European elections” topic for countries where Google News is available in Europe, pulling in the latest election news coverage in your country and across the European Union. You can also stay close to the pulse of the EU elections through Google Trends—the tool that helps surface the top questions, issues and most-searched candidates running in the elections. We’re working closely with news partners across Europe to surface Google Trends data and support data-driven stories on the latest topics related to the election. We’ve also created a dedicated Google Trends EU Election hub for Germany, France and the U.K.
We recently launched two tools to help fact checkers work more efficiently and effectively. When publishers write a fact check article, they can tag the article with information about the fact check—for example, what was the claim being assessed, who made the claim, what was the verdict and more. Adding a tag, or “ClaimReview,” to a fact-check article allows search engines and social media platforms to easily recognize that it’s a fact-checking article, meaning it will show up that way in news and search results. The Fact Check Markup tool makes the process of tagging fact checking content using the ClaimReview even easier for reporters. Similarly, the new Fact Check Explorer helps journalists find fact checking articles for various topics through a simple search function–it is also available to all interested members of the public. The APIs for these tools are open, so developers can build their own applications to assist fact checkers around the world. Driving a healthy news ecosystem online and combating misinformation means forging partnerships with industry organizations. We’re working with First Draft, an organization we’ve supported since they were founded in 2015. As part of the Google News Initiative, we’ve supported four verification training events—two-day intensive workshops—for hundreds of journalists in Brussels, Frankfurt, Madrid and Milan. Journalists were provided with training on digital verification techniques and given access to use CrossCheck, a First Draft platform which helps journalists debunk misinformation and share their findings. We’re also supporting the International Fact-Checking Network (IFCN) to launch FactCheckEU, a collaborative effort with 19 European fact-checking outlets to tackle disinformation and hoaxes. Organizations from 13 countries will share their work ahead of the elections in May, making their analysis publicly available in 10 different languages, with everything repeated in English. 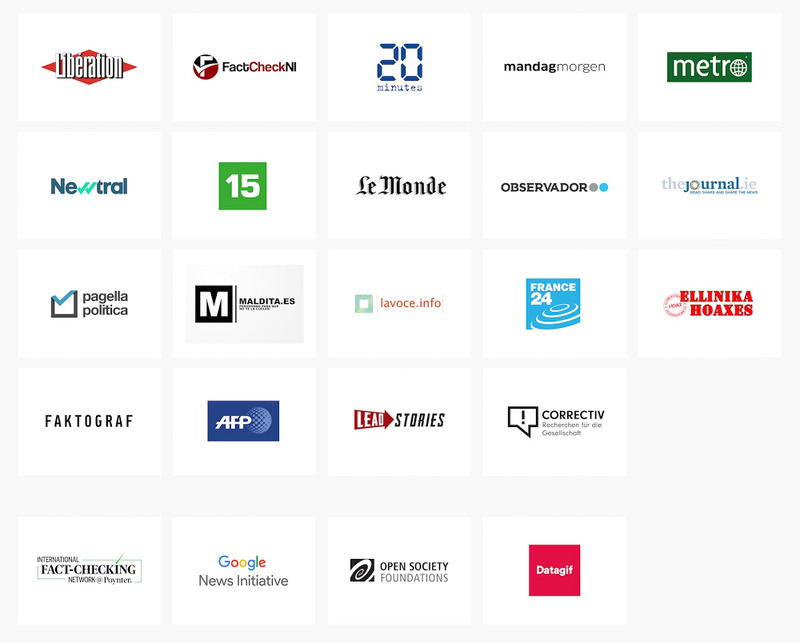 19 European media outlets are participating in FactCheck EU. We’re also providing digital tools and verification workshops across each of the 28 member states. In the last four years, the Google News Lab has trained 65,000 journalists in-person across Europe, and in the last four months alone we’ve supported 4,800 journalists to strengthen their newsgathering and research skills. Workshops have included tips on digital safety and security. For those unable to make the session in-person, the online training center is always available. 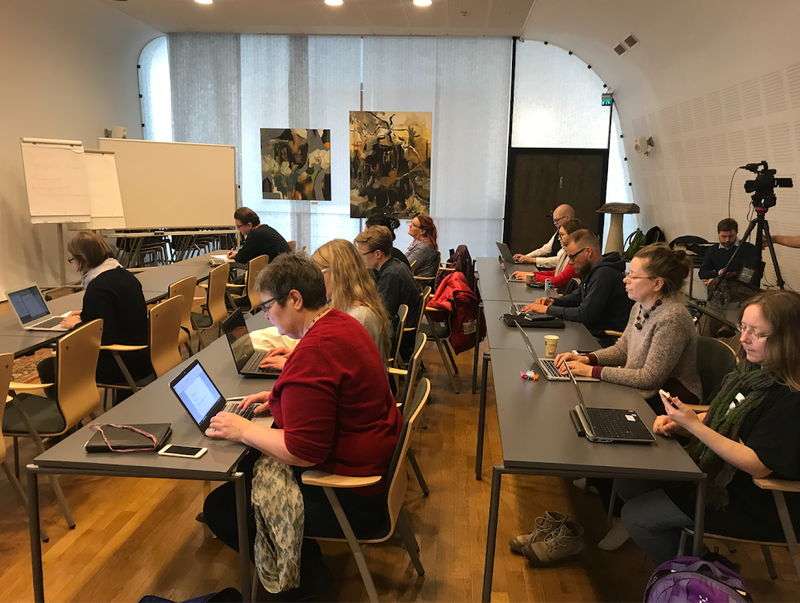 Journalists attending a Google News Lab workshop in Helsinki, Finland. This is just a snapshot of our work around the EU Parliamentary elections. By partnering with trusted fact checking organizations, these new tools can help voters get and stay informed, better understand the political advertising they see and scrutinize and understand rival claims throughout the elections. This entry was posted in Official Google Blog and tagged Google in Europe on April 24, 2019 by The Official Google Blog. Kickstart your cleaning session by setting up a custom routine so your Assistant automatically gets things done for you—like playing your cleaning playlist (because music makes even the most mundane chores better! ), turning on your Whirlpool or Samsung dishwasher, and starting a load of laundry with Whirlpool, LG, GE or Samsung connected appliances. It’s easy to get this set up in your Assistant app for Android or iOS and link smart devices: Just add a custom command like “let’s start cleaning” and then add each action you want your Assistant to take (e.g. start the washer). Once complete, say, “Hey Google, let’s start cleaning,” and watch each action start at the same time. Who said cleaning was a one-person job? Broadcast a message via the Assistant on your phone or voice-activated speaker (like Google Home) to get some help from your family. Say, “Hey Google, broadcast ‘it’s time to clean!’” to rally your family. They can even reply back to let you know they’re on their way. While the Assistant can’t do all of the cleaning for you, it can help you streamline the process and make organizing your home more enjoyable. This entry was posted in Official Google Blog and tagged Google Assistant, Google Home on April 23, 2019 by The Official Google Blog. This entry was posted in Official Google Blog and tagged Sustainability on April 22, 2019 by The Official Google Blog. It’s not only our responsibility to build products and services that are fast and reliable for everyone, but also to make sure we do so with minimal impact to our planet. So this Earth Day, we’re taking inventory of the progress we've made when it comes to sustainability and where we plan to do more. We build products and services that help others become a part of the solution. To date, Nest Thermostats have helped people save a total of more than 35 billion kilowatt hours of energy—that’s enough energy to power the city of San Francisco for three years. Researchers and policy makers use our Google Geo platforms to better take care of our planet. Product like Google Earth Engine help people combat overfishing, monitor forest change and protect the freshwater supply. Businesses that switch from locally hosted solutions to G Suite have reported reductions in IT energy use and carbon emissions up to 85 percent. Organizations that move IT infrastructure and collaboration applications, like Gmail and Google Docs, from a self managed data center or colocation facility to Google Cloud reduce the net carbon emissions of their computing to zero. Our sustainability work isn’t over. When we think long term, we’re working toward directly sourcing carbon-free energy for our operations-—24 hours a day, 7 days a week—in all the places we operate. Already, we’re working with governments and utility companies to chart a course toward making a 24x7 carbon-free grid a reality so more companies and people can decrease their carbon footprint. We know that it is the right path forward, and we have just begun. Along the way we’ll continue to find more ways to protect our planet with our sustainability efforts. Follow along with us in this collection that we’ll be updating all week long in celebration of Earth Day. For seven years, Mother’s Day was the worst day of the year for me. It was an observance that felt completely out of reach, yet commercially and socially it was a reminder that I couldn't escape. I wanted to be a mom, but I was having trouble becoming one. For my husband and I, the inner walls of our bedroom became clinical, timed and invaded by fertility specialists. The outside world didn’t understand what we were going through—they saw us as a couple who decided to "take their time" to start a family. I began doing my own research and found out that 1 in 8 women in America are struggling, too. There are over 7 million of us who want a child but have a disease or other barrier that stands in our way. As today marks the start of National Infertility Awareness Week, I—along with the other brave women in this video—am dedicated to sparking a bigger conversation, and overcoming the stigmas and barriers that surround infertility. I'm excited Google is using its platform to help put this message out into the world ahead of Mother's Day. I hope that this year, even one more person out there will realize they’re not alone. This entry was posted in Official Google Blog and tagged Diversity and Inclusion on April 22, 2019 by The Official Google Blog. There are lots of changes we can make as individuals to combat climate change, but we're taking steps as a company to reduce energy in U.S. households, too. ThePower Project is our pledge to bring one million Nest thermostats to low income families by 2023. Along with a coalition of partners—nonprofits like Habitat for Humanity and the National Housing Trust and energy companies like Georgia Power— we’ve installed Nest thermostats in homes over the last year to help families reduce their energy costs. This year, the Power Project is expanding to include partners Philips Hue and Whirlpool. Along with Nest, they’ll donate thousands of energy-saving technology products to Habitat for Humanity in the coming year. You can join us in providing energy-saving technology to those who need it most in your community by donating to nonprofits at nest.com/powerproject. This entry was posted in Official Google Blog and tagged Google Assistant on April 22, 2019 by The Official Google Blog. 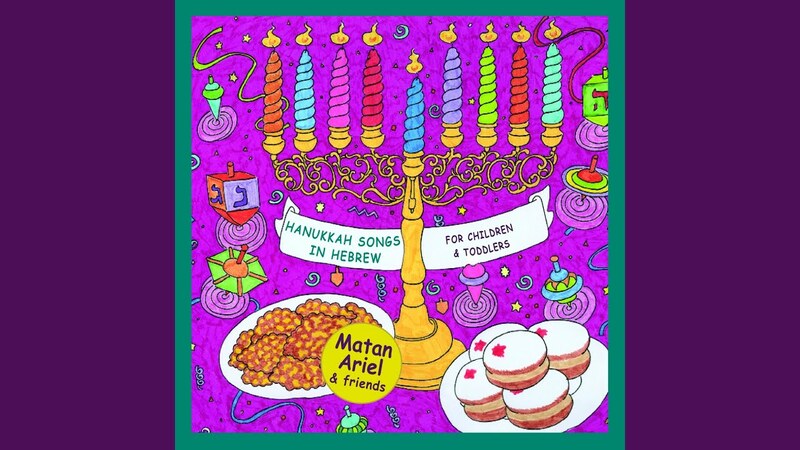 Eventually, the album of Hanukkah songs exceeded Israeli double platinum status. 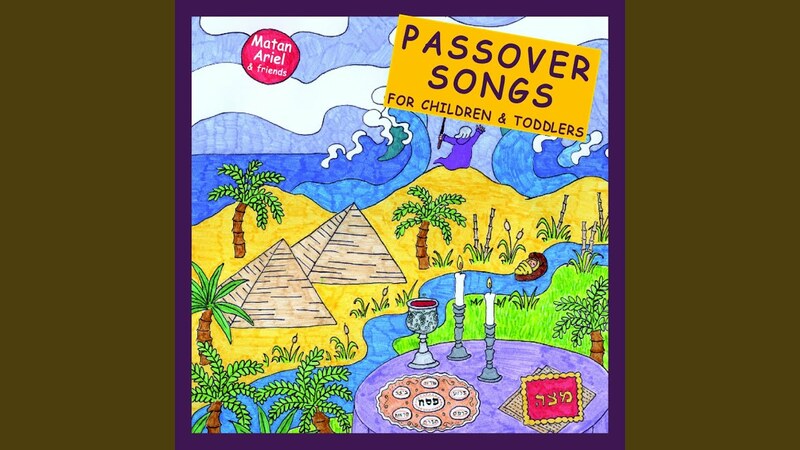 Matan Ariel & Friends recorded 17 albums and five DVDs, about themes like birthdays and animals and around holidays like Passover, Purim and Sukkot. Two of his favorites are an album of Israeli lullabies and an album of Israeli memorial day songs. After he graduated from college, though, Matan decided to step back from music and focus on the business world. These days, he leads a team of ad sales executives who work with agencies to help small and medium businesses use Google ads. He saves his singing voice for karaoke nights with friends and the occasional Googler cover band. At work, sometimes he’ll hand out CDs to his coworkers with children, but there’s one problem: many of them don’t have CD players anymore, so they just stream his music instead. This entry was posted in Official Google Blog and tagged Googlers, Passion Projects on April 19, 2019 by The Official Google Blog. Once you’ve virtually explored the national parks in Google Earth, we encourage you to put down your phone, put on some sunscreen and get outside to explore the wonders that our parks system has to offer. Start by finding the park closest to you. This entry was posted in Official Google Blog and tagged Google Earth on April 19, 2019 by The Official Google Blog. People have always been able to customize their Android devices to suit their preferences. That includes personalizing the design, installing any apps they want and choosing which services to use as defaults in apps like Google Chrome. 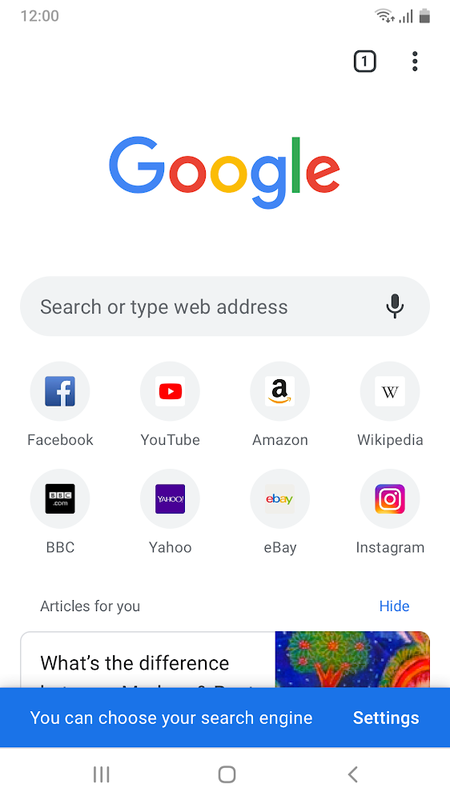 Following the changes we made to comply with the European Commission's ruling last year, we’ll start presenting new screens to Android users in Europe with an option to download search apps and browsers. An illustration of how the screens will look. The apps shown will vary by country. Users can tap to install as many apps as they want. If an additional search app or browser is installed, the user will be shown an additional screen with instructions on how to set up the new app (e.g., placing app icons and widgets or setting defaults). 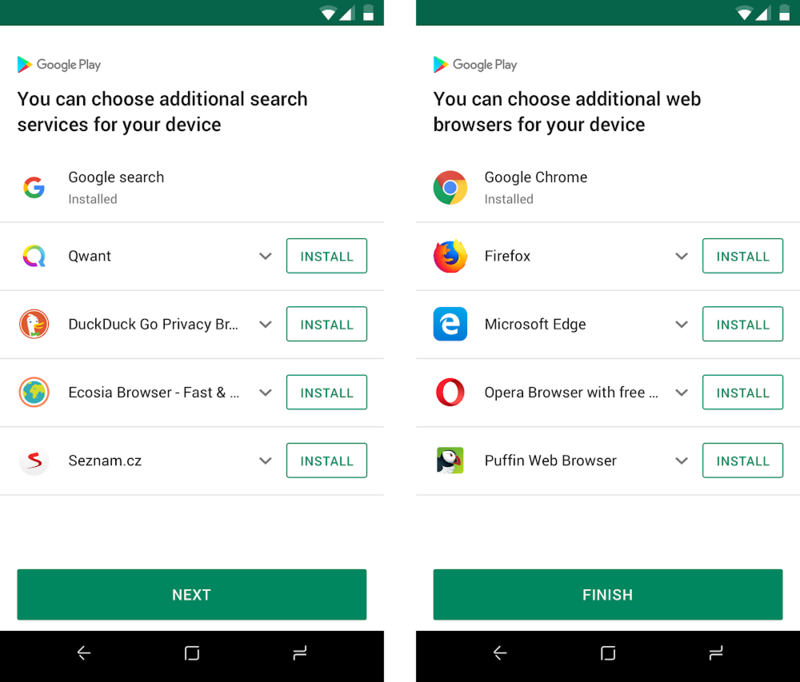 Where a user downloads a search app from the screen, we’ll also ask them whether they want to change Chrome's default search engine the next time they open Chrome. The prompt in Google Chrome to ask the user whether they want to change their default search engine. The screens are rolling out over the next few weeks and will apply to both existing and new Android phones in Europe. These changes are being made in response to feedback from the European Commission. We will be evolving the implementation over time. This entry was posted in Official Google Blog and tagged Google in Europe, Public Policy on April 18, 2019 by The Official Google Blog.